A number of members have received an email from the RA asking them to renew their membership. We can reassure members that anyone who has renewed their membership through the Society does have active membership of the RA. Anyone who has not yet renewed their membership should contact Steve Skilton immediately. Tom Cassidy has been presented with the award of Young Referee of the Year for the 2015/16 season. Tom has excelled on the field, gaining promotion to Level 6 and achieving success as a member of the Cheshire FA Referee Academy. When time allows, Tom volunteers as a mentor to share his support and experience with trainee referees in the District. Tom was presented with the trophy by former winner and now FIFA Referee, Anthony Taylor. The presentation photo and a list of previous winners can be found here. In an effort to improve how they appoint and develop our referees, Altrincham DFA have been working towards a central appointing system for our leagues and referees. From MONDAY 7th DECEMBER 2015, Altrincham DFA will be taking over responsibility for the refereeing appointments for all matches played in the Timperley League (which have been previously appointed by Simon Franks). This appointments process will be overseen by our district referee secretary, Chris Broadhurst (07772376679). If you are not available, for whatever reason, it is vitally important that you “close” any dates via the above email address as soon as possible. Congratulations to Rohan Anand who has been presented with the ADRS Young Referee of the Year award for the 2014/15 season. Rohan was presented with the trophy on Wednesday evening by Kevin Friend, Premier League Referee. Rohan started refereeing at the age of 14 motivated by the potential to earn some money, but saw the potential to progress after transferring into the Altrincham District 2 years later. Attending Development Group meetings and using the wider support network to improve, Rohan progressed to Level 6 and is currently on track to achieve promotion to Level 5. He believes you get out of refereeing what you put in, and has given time back to help mentor new referees in the District. Rohan follows in the footsteps of some notable names – the list of previous winners, and Rohan’s presentation picture, can be viewed here. On Tuesday, Anthony will take charge of the Astana vs. Atletico Madrid UEFA Champions League group stage match. 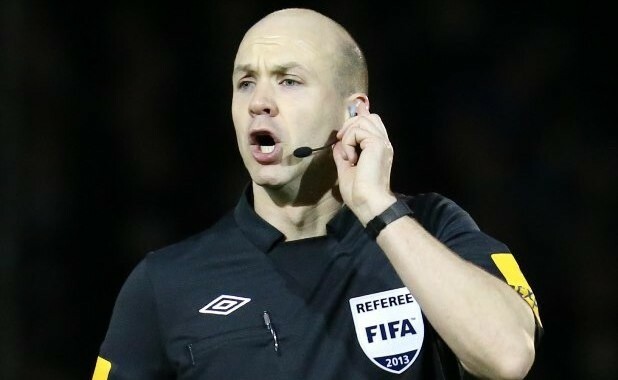 Having previously acted as an Additional Assistant Referee in Champions League matches, and refereed Europa League and International matches, this is Anthony’s first appointment to referee in the UCL group stages. Anthony will be assisted by Michael Mullarkey and Stephen Child, with Martin Atkinson and Jon Moss as the additional assistants. Harry Lennard completes the all English line-up as fourth official.